Yeah, I know, I failed to post at least once a month, the previous post dates back to April… but hey, did you read the title of the blog? In this post, in March, I wrote about documentation and libraries I found useful in getting started with modern OpenGL. After a few months, I have a small addendum to do, both regarding documentation and libraries. When I wrote the old post, I suggested some tutorials and online documentation I had been consulting, and I wrote that I hadn’t heard of any single book suitable to learn modern OpenGL. 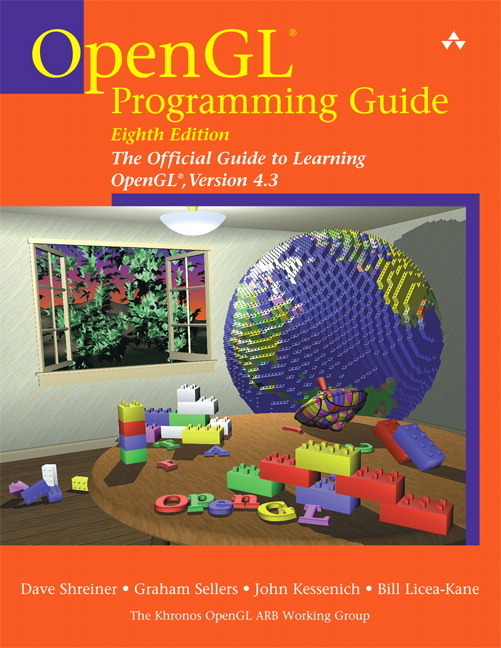 A few weeks after my post, the OpenGL Programming Guide (8th edition), also known as “the red book“, was published – and things changed. I bought it from Amazon (33,50 € – definitely affordable) and spent the last week reading it cover to cover: it’s great stuff, clearly written, well organized, with the amount of detail I expected (not so much to make you feel lost, but enough to give a comprehensive introduction to the API). I wish I had it when I started learning, and I strongly advise anybody trying to learn OpenGL to buy it right now – it will be a time saver. I read that the previous editions were heavily criticized for mixing modern OpenGL with deprecated stuff, probably as a result of incrementally updating the book. 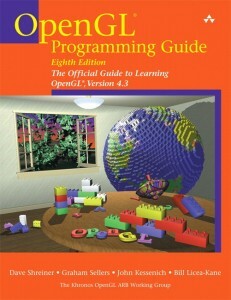 Moreover, GLSL had its own book (“OpenGL Shading Language”, a.k.a. the “orange book”) that, I guess, you definitely needed to supplement the “red book” if you were using shaders. The 8th edition, instead, is a complete rewrite: it doesn’t use or describe the deprecated API, and it covers GLSL too. Yay! Thankyou, book authors! If you read the old post, you might remember that I was quite confused about what was the best image handling library to be used with OpenGL. I listed DevIL, FreeImage, ImageMagick, OpenGL Image (GLI), and Simple OpenGL Image Library (SOIL). Recently, I also stumbled on GL Image, part of the Unofficial OpenGL SDK, that looks promising. The “Unofficial OpenGL SDK” deserves a special mention by itself: it’s a collection of libraries and utilities helpful in getting started with OpenGL development. I motivated my library-picks (GLFW, GLM, GLEW, Assimp) in my previous post, and I was glad to see that more experienced developers also choosed GLFW and GLM for their SDK. For image handling, the thing I was mostly in doubt about, they provided a custom library: I guess I wasn’t the only one unsatisfied in some way by all the popular libs? On the paper, GL Image rocks, and only lazyness and the dependancy on GL Load (the SDK alternative to GLEW, that I’m using) have prevented me to try it up to now. A comparison of all the image handling libraries on some key points (formats supported, features, syntax, license, usability, portability, documentation) would be interesting: it looks like a lot of work, but maybe I’ll try to write something about it in the future. If you were wondering what I am using now, it’s DevIL. The library API is similar in some way to the OpenGL one, and for the very limited usage I’m doing, no problems arise. Unfortunately, it looks like DevIL development ceased in 2010 – you’ve been warned. 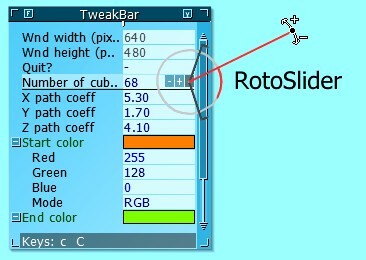 Anyway, postponing my final choice about image handling, there’s another library I’d like to suggest today: AntTweakBar, a GUI library. At the beginning, I limited myself to using keyboard/mouse events to select/move objects and adjust colors or other properties in my test programs. Of course, after a while, I ended up having an unspokable number of unpractical keyboard shortcuts, and no visual feedback about the current state (for example: coordinates of the selected object), that I only printed to the console in response to some key-presses. Don’t even reach that point: use a GUI library to interact with your OpenGL programs right from the beginning, you’ll save time later. That’s it for today! I have many half-written posts in my drafts, so I hope to publish something else soon. TOBUTOMABLO by Dario Scarpa is licensed under a Creative Commons Attribution-ShareAlike 3.0 Unported License. Or you can do what I do when I want to minimize tracking: use the incognito window, dismiss all these useless GDPR messages without even reading them, and live a meaningful life.